The Metcalfe Hall was erected as its name imparts to perpetuate the memory of Lord Metcalfe, who officiated as Governor General of India from March 1835 to March 1836. 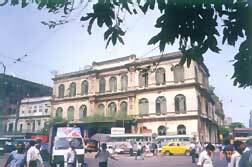 It was originally conceptualised as a Public Library later on housed the Imperial Library. 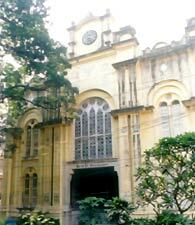 St. John's Church, the first Anglican Cathedral of Kolkata stands at the crossing of Hastings Street and Council House Street. On 6th April, 1784 the foundation stone of the church was laid which was made bigger in 1811 and 1863 and Lord Minto gave it a face lift. In this Church Doric columns instead of Corinthian were used to make it suitable for decoration on the stone, which was later changed to Corinthian ones. Soon after its construction Thomas Daniell had done an engraving on it. The interior of the Church has a painting by Sir John Zoffany, a reproduction of the 'Last Supper'. Originally it was placed over the altar. This is a handsome three storied building, designed in Italian style, the walls were made of brick. 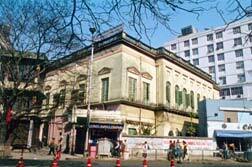 Founded in 1833, it at first housed Agra Bank. 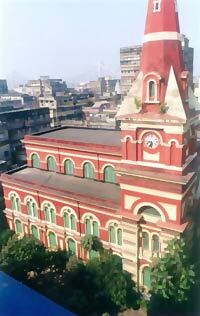 The building was named as the Currency Building when the Government occupied a large portion of it for its Currency Department in 1868 from the Agra Bank Limited. The roof was arched on iron joist and the floor covered with marble and chunar sandstone. A handsome gate at the entrance in three parts, is of a very florid design in wrought iron. The Central Hall gets sunlight through skylights overtopping the large domes. The Central Hall & a row of exchange counters for notes gold, silver and other change. The Currency office has a vault of a massive masonry lime on its roof, walls and floor. The second floor is similarly designed and the then Assistant Commissioner in-charge of the Currency Building had his residence there. The rooms above are spacious and are paved with Italian marbles. The Asiatic Society is the oldest Institution of Oriental Studies in the world founded by Sir William Jones (1746-94 AD), Sanskrit Scholar and Judge of the Supreme Court at Kolkata. This symmetrical two-storyed brick building with plaster work represents the 18th century British Colonial Architectural style. The interior is more elaborate than the exterior. There is a grand staircase with a low podium steps. There is a central hall in the first floor with two rooms on either side of it. It has free standing columns with Ionic Volutes as capital and semi-circular arches. The ground floor rooms are now being used as stack rooms while there is a chemical laboratory in the first floor. 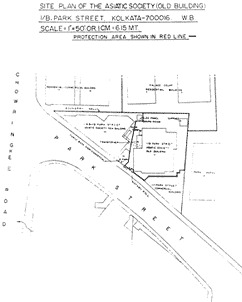 The old building is now connected with the present building by a pass way. 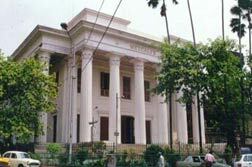 The old building of the Asiatic Society is a historic building because it gave birth to the Research in Indology and took a lead in the dissemination of knowledge of our great cultural heritage and thus this building has become the part and parcel of the oldest Institution of the Oriental Studies in the world. Maghen David Synagogue built in 1884 in Victorian architectural style and largest Synagogue in the east, comprises a central nave (92-33 ft.) with two side aisles. In the centre of nave exists the pulpit (Tebah) from where the Kohen conducts the prayer. Above the entrance is a mosaic arch with intricate ornamentation inscribed with three biblical verses. In the centre is the design of a Maghen David bearing the name of the Synagogue in the inner hexagon. The interior is apsidal on the western side with raised platform and a vaulted roof to bless the congregation by the Kohen and to perform the weddings and other rituals. Having a rectangular courtyard in front of it this Synagogue is placed on a platform. This is approached by 15 flight of marble steps which is flanked by one room in each side. The left hand room facing the entrance has two doors serve the purpose of the office of the Synagogue while the right hand room is used to go to the upstairs having a staircase inside. The main hall is entered by one central door and two subsidiary doors all made of wood. The 'pulpit' which is also placed on a slightly high platform is enclosed by wooden railings richly ornamented with silver plates. The extreme end of the hall is oval shaped which is richly ornamented and decorated with different types of coloured glass panes serving the purpose of sky light. The exterior of the Synagogue is noticeable in the first three parts viz., (i) ground opening with flight of steps (ii) armed huge glass pane design compartmented into eight parts on which five are colour glass design can be noticed (iii) big clock centrally placed. From a Tablet placed at the entrance indicated that this Synagogue was built in the year of 1856.